Ammex GPNB46100 GlovePlus Black Nitrile Powder Free. Black nitrile gloves! 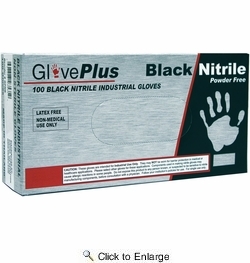 GlovePlus high performance industrial grade black nitrile gloves. Powder free and latex free. GlovePlus black nitrile gloves provide superior comfort and strength, combined with unsurpassed tactile sensitivity. Our black nitrile gloves have three times the puncture resistance of comparable latex or vinyl gloves, making these gloves an excellent choice. 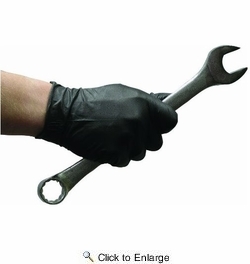 These industrial grade black nitrile gloves contain no latex proteins, and no powder that could leave residue. Textured for enhanced dexterity. 4 sizes (M-XXL). 100 gloves per box.